I’ve been wracking my brain thinking about all the different things I could do with a pumpkin for the blog. Then I thought it’s all very well doing something mad and adventurous but how about I keep it simple and do something that everyone can manage, even if they don’t have a lot of time. So that is what I have come up with for you. First up, so simple but so effective. 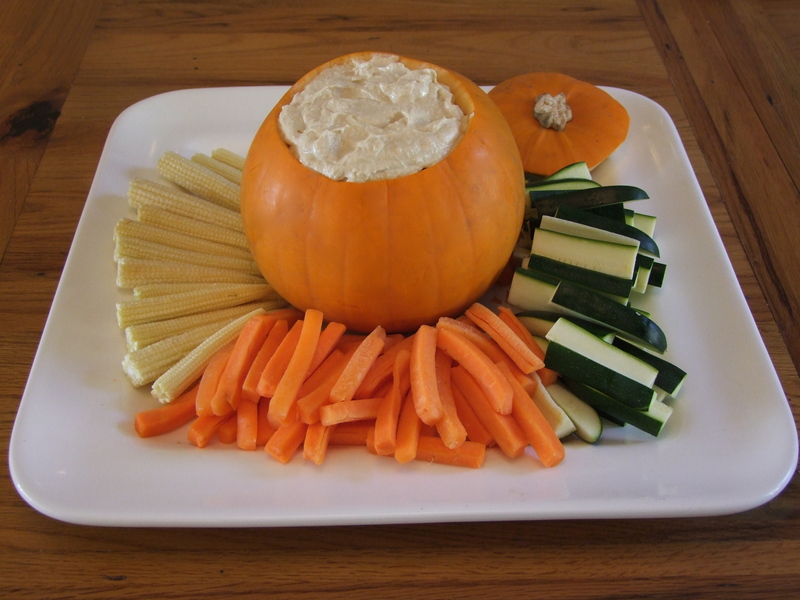 All you need is a platter, a pumpkin, your choice of dip, veg sticks or nachos, crisps or bread sticks etc. You will also need a sharp knife, a boning knife is perfect as it has a good bend. Being very careful pierce the pumpkin at a 45 degree angle around the top and slowly slice it around in a circle. There is no need to scoop out the pumpkin unless you really want to fill it! If you want you can line it with tin foil to stop anyone from scooping a seed. Then all you have to do is fill it with dip. Voila. So simple, so effective. Next up, the cheats guide to pumpkin carving. It’s actually a real skill to carve a pumpkin, getting a knife to do exactly what you want in the thick wall of a pumpkin is easier said than done. So don’t. Cheat! This is what you will need. A pumpkin, metal cookie cutters and a rolling-pin or mallet/hammer. As before, slice a lid for your pumpkin and then scoop out all the flesh and seeds. Once the shape has punched through you will need to give it a poke to bring it through inside! Keep going until you have created your design. This last picture is just for fun as I’m very impressed with my sisters pumpkin carving. She’s over in the states at the moment where they take Halloween VERY seriously! She was inspired by the cartoon Calvin and Hobbes (both of our favourite comic strip as kids). Isn’t it fantastic?! I love that they leave the stalk nice and long on American Pumpkins, I’m hoping the whole pumpkin patch thing might take off over here. I think there are a few around but sadly none near me. Well that’s it from me for now, have fun with your Halloween decorations and if you want some more inspiration check out my Halloween Pinterest board. Here.